At Helicon Collaborative, we were excited when HowlRound approached us to help tell its story. And not just because we love HowlRound—though we do. Like an acupuncture needle expertly inserted, the right story told at the right time can help reregister or shift a system. We believe HowlRound’s story is particularly resonant for this moment in time, and has potential to influence thinking and shift practice in the theatre sector and beyond. This essay shares a few thoughts on why we think HowlRound’s story matters in today’s political and economic context. You can read the case study in full. What was wrong in the theatre sector was a symptom of a much larger dysfunction in our society—capitalism run amok. The majority of philanthropic money was going to the largest and wealthiest theatres, despite the fact that their audiences were not reflective of the American population (i.e. they were older, whiter, and wealthier). These institutions functioned in a way that was increasingly indistinguishable from commercial theatres, programming blockbuster shows with star casts for which they could charge top ticket prices. Meanwhile, a tremendous amount of vibrant artistic creation and engagement was happening outside of these institutions, in small nonprofits or in community settings across the country. Overall, theatre was fueled by the “sweat equity” of artists, who, even when artistically successful, were rarely able to make a living off their work. With the rising cost of living in many places, this was becoming increasingly untenable, especially for artists without other sources of wealth or income. Access to the financial resources, information, and platforms to create and share work was closely guarded by a small number of “gatekeepers” at major institutions and were inaccessible to the majority of artists. These reports provided some useful data, but, truthfully, they surprised no one. People in the sector knew the theatre model wasn’t fulfilling its artistic promise or public benefit. What to do about it was the question. As political organizer, author, and activist Jonathan Matthew Smucker points out, “Knowledge of what is wrong with a social system and knowledge of how to change the system are two completely different categories of knowledge.” HowlRound, founded that same year, was significant precisely because it offered not only a diagnosis of the problem in the theatre field, but also a potential remedy. HowlRound’s founders—P. Carl, David Dower, Jamie Gahlon, and Vijay Mathew—knew that the issues facing nonprofit theatre weren’t just “theatre issues.” Our current era is characterized by concentration of power and wealth in the hands of a few; exploitation of workers for low wages; systemic barriers to opportunity and resources, magnified along class and racial lines; underfunded public and social goods and services; and commodification of everything for corporate profit. Michael Sandel, political philosopher and author of What Money Can’t Buy, writes that, “We live at a time when almost everything can be bought and sold. Over the past three decades, markets—and market values—have come to govern our lives as never before.” The nonprofit theatre sector had absorbed this trend, but theatre wasn’t the root of the problem. What was wrong in the theatre sector was a symptom of a much larger dysfunction in our society—capitalism run amok. It is no longer a radical position to argue that capitalism is broken—at least in its most aggressive, neoliberal form that prioritizes profit and free markets above all else. The Pope has said it. So have many prominent business and political leaders in the US and worldwide. Even the International Monetary Fund has admitted that the neo-liberal policies of the last several decades have caused more harm than good, and not delivered on its promises. Simultaneously, in the past decade there has been a decline in happiness and wellbeing, even among the wealthy. Following capitalism’s tenets, we have destroyed our natural ecosystem to the point that our survival as a species is threatened. Young people especially are disillusioned with the status quo: a recent Gallup poll found that Americans aged eighteen to twenty-nine (those who came of age during the 2008 Great Recession) are more positive about socialism (51 percent) than about capitalism (45 percent). However, calling capitalism “broken” is also misleading. It is functioning precisely as designed—to maximize profit. But when it comes to supporting human flourishing, artistic creativity, ecological health, cultural traditions, or almost any other social outcome, the system appears to have major design flaws. HowlRound team (L to R): Vijay Mathew, Jamie Gahlon, Ramona Ostrowski, Abigail Vega, JD Stokely. Photo by Anya Prudente. One of the biggest challenges to reforming the system is the fact that the values and practices of capitalism have become so normalized that they often appear to be “just the way the world works.” The late, great Ursula Le Guin alerted us to our critical misunderstanding of our own role in this dynamic: “We live in capitalism,” she wrote. “Its power seems inescapable. So did the divine right of kings. Any human power can be resisted and changed by human beings.” Before we can begin to imagine something better, we must recognize that the systems we have now do not have an intrinsic reality outside of us. This means we can un-make them and create something new—as, in fact, we have done many times in the past. 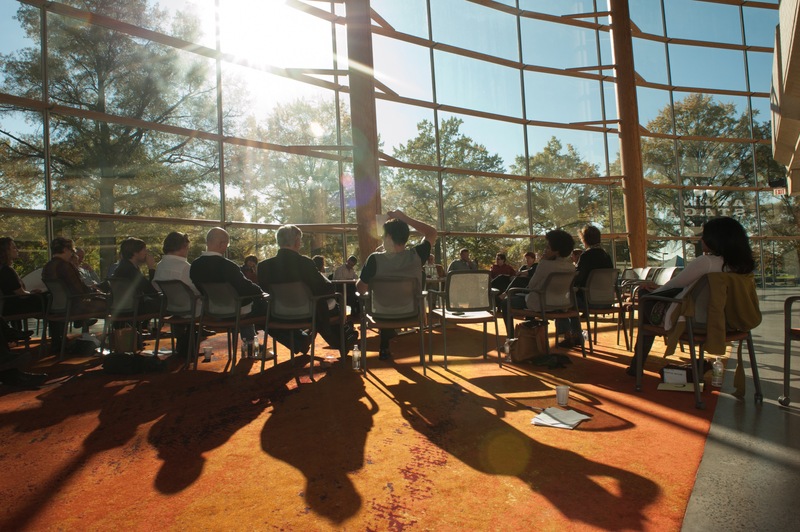 In-person convenings of theatre practitioners to discuss issues and ideas affecting the field. It was an experiment with a new kind of infrastructure for the field—one that intentionally sought to support values of openness, collaboration, and community; in contrast to the institutional theatre structure, which reinforced maximizing profit, hierarchy, and competition by design. of individuals to organize and exert collective influence. We are left with the question of whether it is possible to change conditions in the theatre field without addressing the inequities and dysfunctions in the larger socioeconomic system within which theatre is embedded. HowlRound was first and foremost intended to be a set of useful tools for the field, and it fulfilled that purpose. It has posted thousands of articles and videos, and is visited by more than 45,000 unique users per month. But on a philosophical level, the founders were inspired by and worked to advance the idea of the “commons,” which is the notion that—even within a capitalist system—there are certain kinds of resources that must be protected from private ownership or market forces so that they can be used by and benefit all, without being used up or degraded. In our current context, this idea might seem quaint or wildly idealistic, but it is actually how we already manage natural resources like air, soil, and water, and public goods such as parks, roadways, and utilities (although many of these, too, are being privatized). The commons was always intended to be a rational check on private ownership and the market, in order to protect public resources. HowlRound’s founders believed that cultural resources belong in the commons too, protected from commercialization and privatization. But the existing infrastructure of the theatre field made it difficult to share resources, collaborate, or act on behalf of the common good. HowlRound sought to be a different kind of infrastructure that encouraged and enabled theatremakers to share resources, work, and information, and collaborate around shared interests and goals. and where theatre is taught and studied, opening up possibilities for artists outside of traditional “theatre centers.” The long-term impacts of this are yet to be seen, but systems experts note that changing who has access to information and enabling people to self-organize are two of the most important leverage points for creating transformative change in any system. An early HowlRound convening: In the Intersection: Non-Profit & Commercial Producers in the New Play Sector, Washington DC, 4-5 November 2011. However, we are still a long way from manifesting a nonprofit theatre system that, overall, values and supports diversity, cooperation, and participation over competition and profit. There is greater awareness of structural inequities than ten or fifteen years ago, but this has not yet translated into a significant redistribution of money and power, which are still highly concentrated in the hands of very few institutions and individuals and directed towards supporting a limited range of content. Some question whether our nonprofit structures are capable of supporting commons values and practices at scale. Commons scholar David Bollier suggests that we need to design “a wholly different set of institutions, legal regimes and social practices” that are founded in these values. Others have suggested that philanthropy can and should play a stronger role in incentivizing and supporting commons-oriented behavior and structures in the social sectors. The fact that daunting challenges remain does not imply that HowlRound has fallen short in its work to date. 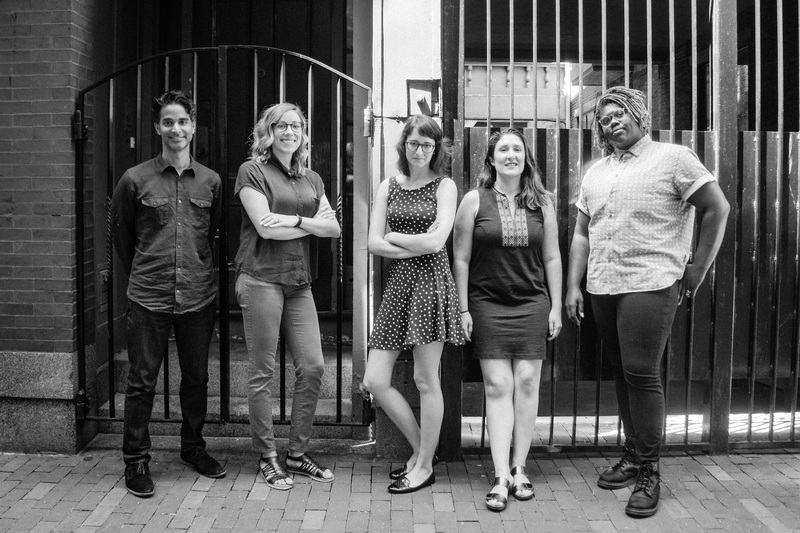 On the contrary, it is because of the profound reach and impact that HowlRound has had in a relatively short amount of time that many in the field believe HowlRound can be a catalyst, organizer, and host for the difficult conversations that need to happen to bring about larger structural shifts in theatre and our society as a whole. HowlRound is already beginning to gather stakeholders in the field to discuss this next phase of work. Appropriately, the next phase of the commons will be defined by the commons itself. Thank you for your work on this, Helicon. It's been an incredible journey and I am so grateful for the care and wisdom you've brought to the story of the who, how, what, and why. We're all so immersed in the moment to moment caretaking of the commons that we've got precious little perspective, much less time to share it. It's revealing to see how it looks from the outside.